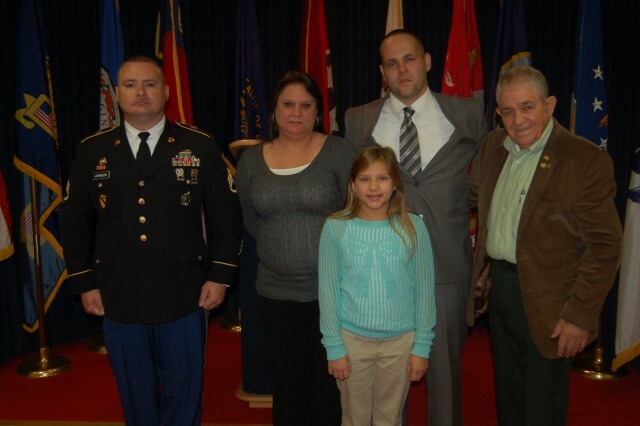 KNOXVILLE, Tenn. (November 14, 2013) A Pikeville, Ky., attorney's long-standing desire to return to the military was rekindled partially by reruns of a military drama and a proud family tradition. 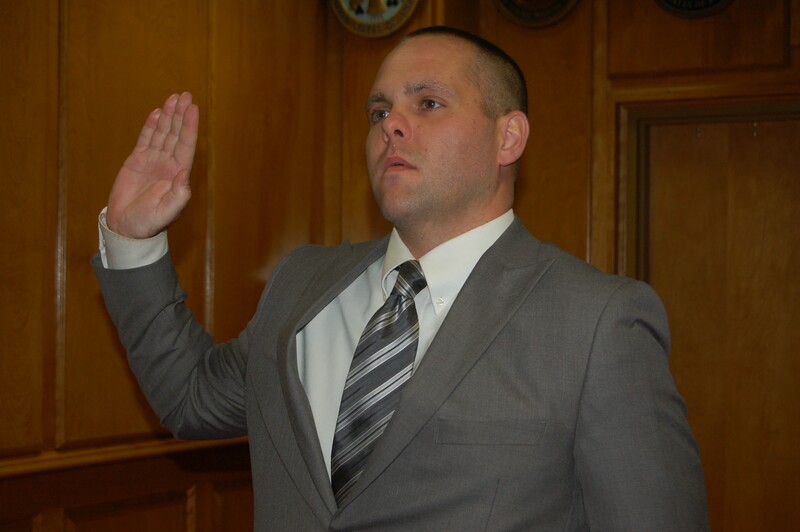 Justin C. Hamilton, 32, enlisted into the Army Reserve nearly 10 years after leaving active duty as a member of the U.S. Marine Corps. He will now be serving part-time as an ammunition specialist with the 861st Ordnance Battalion in Cross Lanes, W.Va., after being sworn in at the Knoxville Military Entrance Processing Station, Nov. 14. "I've been missing the camaraderie of being in the military," said Hamilton who served in the Marine Corps from 2000-2004. "I missed the whole atmosphere. My time in the military was the only time in my life I haven't been bored." 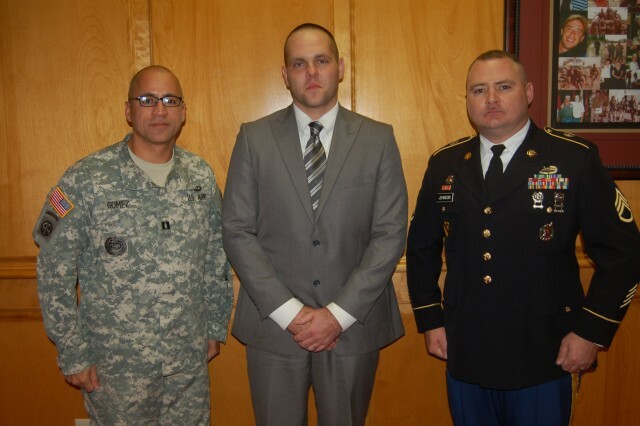 After returning home from his military stint, the 1999 graduate of Millard High School finished his undergraduate work at the University of Pikeville. He went on to complete law school at Appalachian School of Law and started practicing at Hamilton & Stevens Law Office in Pikeville, where his brother, James, is a partner. While settling into his life with his wife, Michelle, and their 11-year-old daughter, Courtney, Hamilton said he knew all along something was missing. He did color guards at local funerals and worked as a volunteer firefighter and baseball coach. It was only after Hamilton and his wife started watching reruns of the Lifetime network's "Army Wives" that he knew he wanted to return to military service. Both enjoyed the military drama that portrays the lives of Army families and it got them to thinking of rejoining the ranks. The couple wed in 2000 after Hamilton returned from Marine Boot Camp. They enjoyed their time in the service and watching the television drama reminded them of past memories. Shortly afterward, Hamilton visited the Pikeville Center. It was there he met Center Commander Staff Sgt. William Johnson. "At first, it was a mild interest," Johnson said. "We spoke extensively and we soon focused on the Army Reserve." While Hamilton said at some point he may try to serve as a legal officer, he's content to join his new unit as a specialist. He will soon start weekend training with his new unit. "It's been a while," said Hamilton referring to his time out of uniform. "It will be good to get back into a unit and back into the swing of things." As he contemplates his return to the military, Hamilton views it as a way to continue his public service. At the same time, he said his service in the Army Reserve will give him a brief respite from the fast-paced life of an attorney. "It's a really, really stressful job," Hamilton said. "You have adversaries on all corners and after a while it wears on me." Claudie D. Little. A Korean War veteran himself who served in the Marines from 1952-1995. Little said he was thrilled to be on hand for his grandson's big moment. "I'm proud of him whatever he does," Little said. "He's like my son. As he climbs the ladder, I'll be there with him." A retired coal miner, Little said he had no heartburn with Hamilton donning Army green, adding there was honor serving the nation in any uniform. "They make no difference," Little said. "We're all fighting for the same cause." After the ceremony, Military Entrance Processing Station executive, Capt. Ramon Gomez congratulated Hamilton; is family embraced him. "I'm speechless," said Michelle Hamilton. "He's been wanting to do this for so long, I just don't know what to say." Hamilton joined a unit that is 90 miles away from his home. He said he's just glad to have found a place to serve. Hamilton's recruiter said he'll be a fine addition to his unit. Johnson said he looked for great things from Hamilton no matter what final course of action he chooses. "He's going to be an outstanding Soldier," Johnson said. "He's committed to [the Army] and I know he will do well."